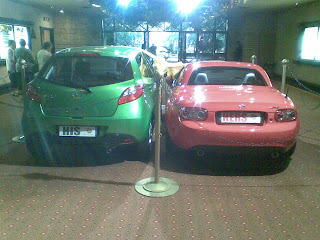 Friends of ours blessed us with a week's holiday with them at their timeshare at Sun City, and on our walkabout today I saw these two cars. At the risk of blowing my feminist theologian credentials, if we were to win these cars (improbable since we don't gamble), how come Belinda gets the zooty 2-door convertible, and I get the oh-so-practical-but-boring hatchback? The marketing person in charge of setting up this display HAS to be a woman - guaranteed!